Saint Xavier University (SXU) and the Field Museum join forces to better understand our world 278 million years ago and the ancient animals that roamed the southern tropics. In a study published in Nature Communications, scientists from The Field Museum and colleagues from around the world describe several new amphibian species and a reptile from northeastern Brazil that help fill this key geographic gap and reveal how animals moved among regions in the supercontinent. 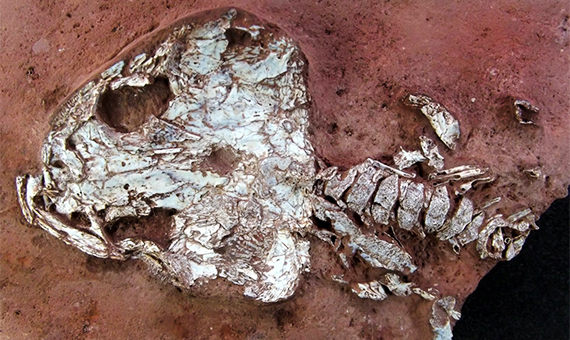 SXU Assistant Professor Rudyard Sadleir in the Department of Biological Sciences joined the collaboration to extract and digitally reconstruct the new species of fossil amphibian that was still buried in the rock. "The discoveries highlight the growing use of new technologies available to paleontologists. The extremely fragile fossil bones from Pedro de Fogo are preserved in a hard, cement-like rock. In order to see some of the fossil, we used a high-powered x-ray to look inside the rock and reconstruct a 3D, digital model of the fossil in a computer. These are some of the skills I train my research students in at the SXU campus and the Field Museum," stated SXU Prof. Rudyard Sadleir. The paper describes two new species, both archaic aquatic carnivorous amphibians. One, Timonya annae (tih-MOAN-yuh ann-AYE), was a small, fully aquatic amphibian with fangs and gills, looking something like a cross between a modern Mexican salamander and an eel. The other new species, Procuhy nazarienis (pro-KOO-ee naz-ar-ee-en-sis), an amphibian whose name in the Timbira language of its Brazilian homeland, means "fire frog." Procuhy didn't live in fire, though -- it spent its whole life in water. Its name comes from the Pedra de Fogo ("Rock of Fire") Formation where it's from, so named for the presence of flint. Although both species are distant relatives of modern salamanders, they are not true frogs or salamanders, but members of an extinct group that was common during the Permian. In addition to these two new species, the paper also describes a collie-sized amphibian whose closest relatives lived in later times in southern Africa, and a lizard-like reptile species that until now has only been found far away in North America. The fact that these species have also been found in modern-day Brazil helps scientists paint a picture of the ways that animals spread during the Permian and how they colonized new areas. "Discoveries such as these advance our understanding of how life has and continues to evolve on our ever-changing planet," said SXU Prof. Sadleir. "The data are our best resource for rationally anticipating what could be in our shared future by revealing this unknown time and place in our natural history." This research was sponsored by the Negaunee Foundation, The Grainger Foundation, The Field Museum, Conselho Nacional para a Ciência e Tecnologia, National Geographic Society Committee for Research and Exploration, Universidad de Buenos Aires Ciencia y Técnica, a Sofja Kovalevskaja Award of the Alexander von Humboldt Foundation, and the Natural History Museum of London. The research team includes scientists from Brazil's Universidad Federal do Piauí, Argentina's Universidad de Buenos Aires, the Iziko South African Museum, South Africa's University of Witwatersrand, London's Natural History Museum, Berlin’s Museum für Naturkunde and Humboldt-Universität, and Chicago's Field Museum and Saint Xavier University.